The relationship between human rights and the environment is a fascinating, uneasy, and increasingly urgent one. JHRE is an international journal providing a strategic academic forum in which an extended interdisciplinary and multilayered conversation can take place concerning the challenges located at the interface of these two centrally important fields. We are delighted to announce that issue 4:2 is now available. Visit the journal’s online platform on Elgaronline to browse the contents and read abstracts. Three articles in the current issue can also be downloaded for free. You can also find details on how to subscribe. We encourage you to consider recommending the journal to your library. 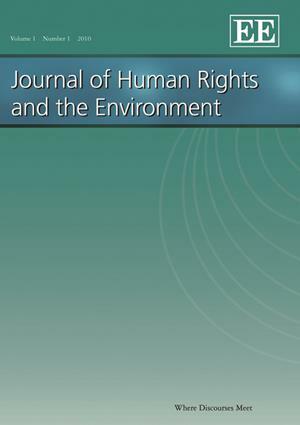 FREE ARTICLE: Proposed Universal Covenant – Universal covenant affirming a human right to commons- and rights-based governance of Earth’s natural wealth and resources. Nigel Bankes and Timo Koivurova (eds), The Proposed Nordic Saami Convention: National and International Dimensions of Indigenous Property Rights (Hart Publishing Ltd, Oxford 2013) 436 pp. Farnhana Sultana and Alex Loftus (eds), The Right to Water: Politics, Governance and Social Struggles (Earthscan, London and New York 2012) 288 pp.